Love is equally the most wonderful and most painful emotion that humans can experience. It has the power to lift you up to be a better person and it can destroy you in a blink of an eye. In Time Freak, a great young cast of upcoming A-listers struggle with the realities of life in love while adding the interesting complication of time travel. On the surface, the ability to travel back in time and fix all of the little problems of a relationship sounds like a good idea, but love is much more complicated than that. The two stars of the film, Asa Butterfield and Sophie Turner, aren't quite household names yet, but they will be soon. If you're a fan of Game of Thrones, then you were early on the Sophie Turner train as she has slain (literally and metaphorically) the competition as Sansa Stark on the incredibly successful HBO show. Asa Butterfield might be someone that you're less than familiar with, but he's been putting together a strong string of acting performances in such films as The Boy in the Striped Pajamas, Hugo and Miss Peregrine's Home for Peculiar Children. 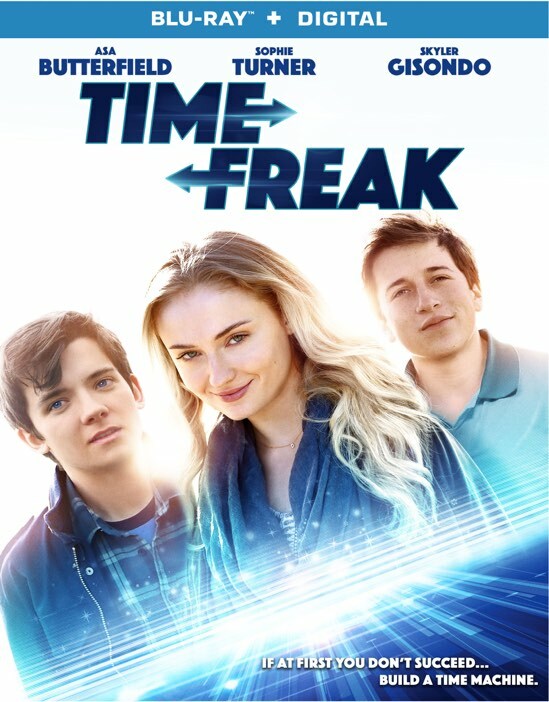 In Time Freak, these two stars get a chance to let their hair down a bit and play with the concept of time travel. While the film seems to borrow liberally from the Hot Tub Time Machine theory of time travel over some of the more serious attempts to incorporate time travel into films, the process works. When Sophie's character breaks up with him, Asa's character (which happens to be a stud in physics) decides to build a timeline of their relationship and a time machine to go back and fix whatever went wrong to eventually result in their breakup. The idea seems interesting at first, but as the movie progresses, the schtick quickly loses its excitement and the audience starts to poke holes in its premise. The concept probably works best as a short film and it's not surprising that Time Freak is a full-length adaptation of writer/director Andrew Bowler's Oscar-nominated short film of the same concept. Of course, that's not to say that the feature-length version is without merit. The original short film, which is included as a special feature on the Blu-ray, lacks the star power of this version and it's precisely this star power that makes the film palatable at this length. That's not necessarily a knock against the actors in the short film, but I could literally watch Sophie Turner read the phone book for 90 minutes and come away enthralled. I would have been far more impressed and interested in the film had they opted to go more along the About Time path of time travel ramifications. It's one thing to completely dismiss the consequences of our decisions, but it's another thing altogether to set up a character arc and then to quickly wrap things up with a bow. All in all though, I did find the film entertaining in much the same way that I found Just One of the Guys entertaining when I was ten. The only issue is that I'm no longer ten, but I'm sure the younger generation that hasn't seen these types of 1980s teen comedies will be entranced by Time Freak. Time Freak is now available on Blu-ray and DVD.